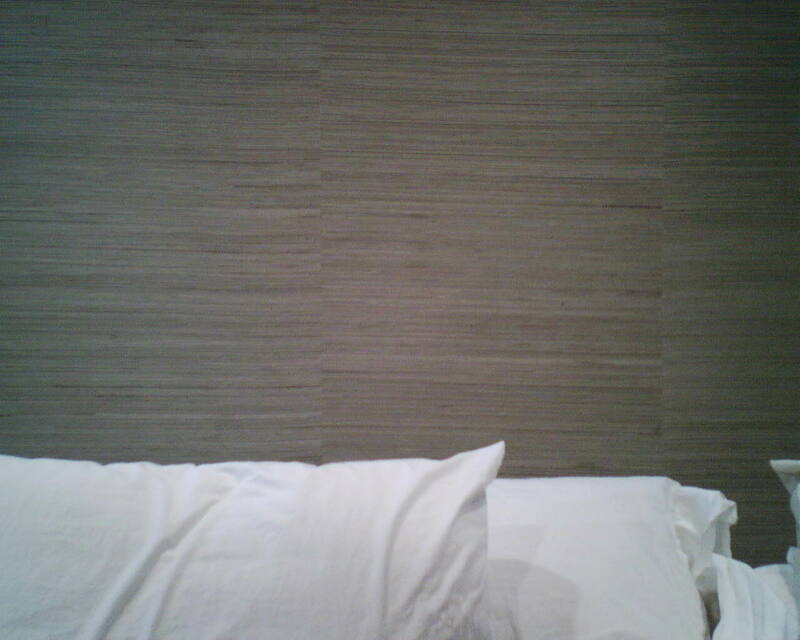 To me, this textured wallpaper looks like a knight’s armor! And, to be honest, it will wear almost as well as armor, too. It’s a heavy vinyl material with a scrim-backing (loosly woven fabric), that is commercial-grade – like what they put in hotels and nursing homes, so it can be scrubbed and banged into and still look great. Note that on thick papers with plain, no-match patterns and heavy textures, the seams do show more than on thinner papers (2nd photo). Depending on how the light hits it, and how far away you are standing, this is really not a big deal, and is expected on this type of paper. 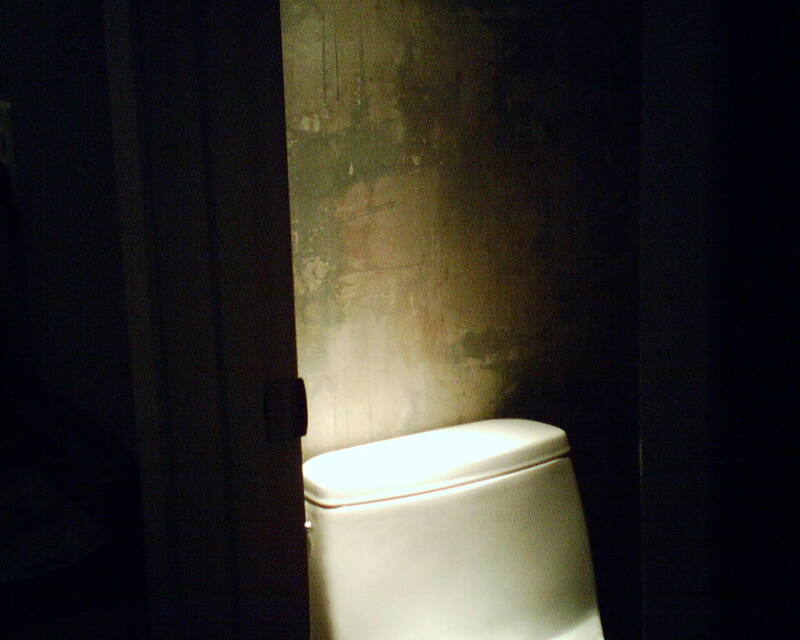 I hung this in a single guy’s master bathroom in the Museum District of Houston. This wallpaper pattern is by Thibaut Designs, and was bought at a discounted price from Dorota Hartwig at Southwestern Paint on Bissonnet near Kirby. (713) 520-6262 or dorotasouthwestern@hotmail.com. Discuss your project and make an appointment before heading over to see her. 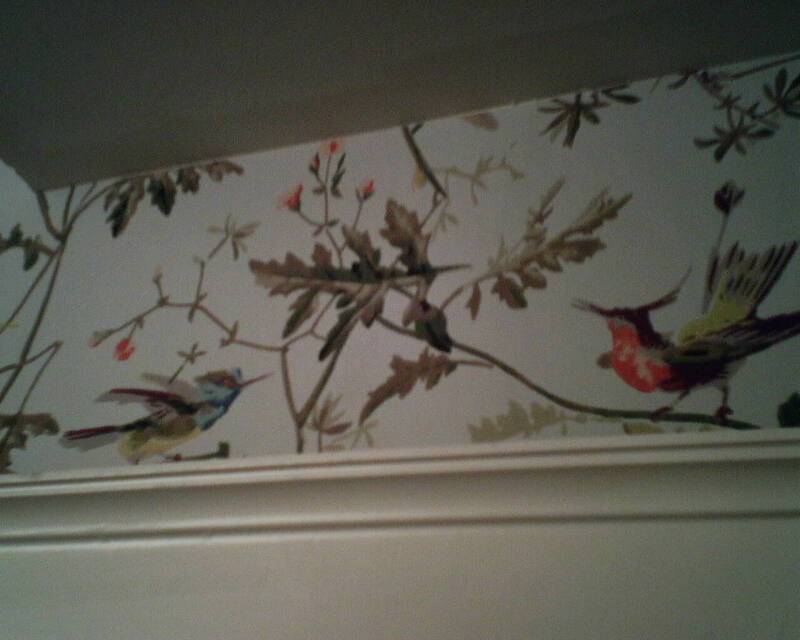 Shots of wallpaper I hung Friday. The top one looks textured in the photo, but it is a flat paper. The second one looks much better in real life than the photos allow – it looks like old crackly paint in beautiful teal and tan colors. 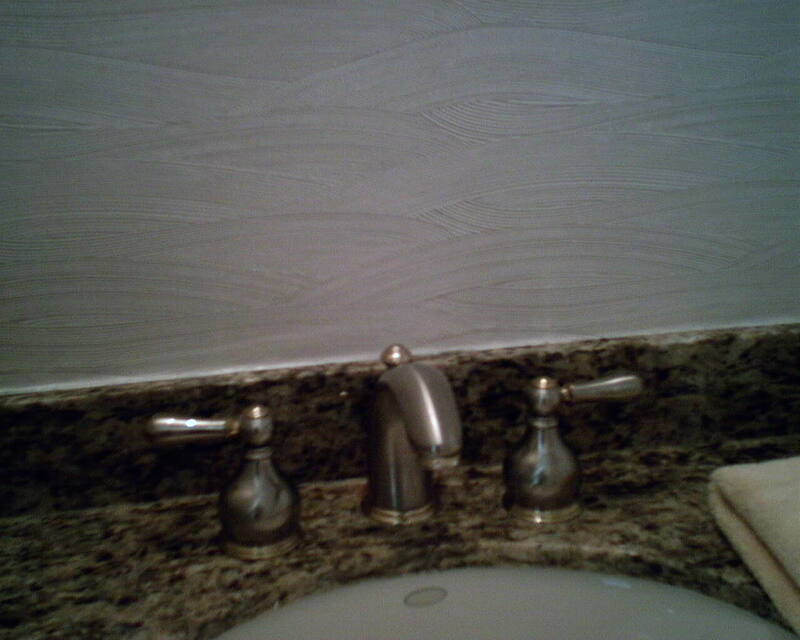 This is my favorite out of the three baths I am doing in this home. Both papers are by WallQuest, their EcoChic line, and were bought at a discounted price from Dorota Hartwig at Southwestern Paint on Bissonnet near Kirby. (713) 520-6262 or dorotasouthwestern@hotmail.com. Discuss your project and make an appointment before heading over to see her. 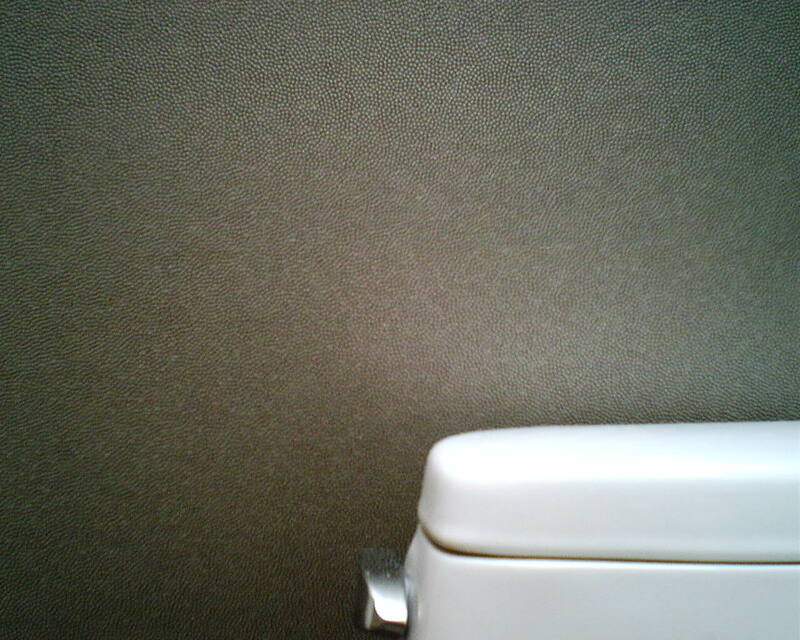 This wallpaper pattern has an unusual match – it’s a multiple drop match. Usually, there are two standard types of pattern matches … one is “straight,” which means that the same design element is at the top of every strip. But on a “drop match, the design will be at the top of the first strip, but then drop down a few inches on the next strip. By the third strip, it’s back up to the top. But in “multiple drop matches,” you don’t have this kind of predictable rhythm, and the pattern match drops differently and somewhat irregularly … hard to explain. But you had better catch this BEFORE you start cutting your strips, or you are going to ruin a whole lot of paper because none of the strips will match up with each other. It’s hard to see in the photos, because the flowers look the same – but they’re not. If you look closely, you will see that one particular flower is never at the top of the wall more than once, even after four strips. This weird pattern match required that, instead of knowing what each strip would look like and being able to cut all my strips at once, instead, I had to lay out each strip and then lay out the one to go next to it, to find the pattern match. And I had to keep track of which strips were to be placed on the left and which were to be placed on the right. Oddly, the ones heading left matched with little waste. But when I started going to the right, much more paper had to be rolled off and discarded before the pattern would match correctly. 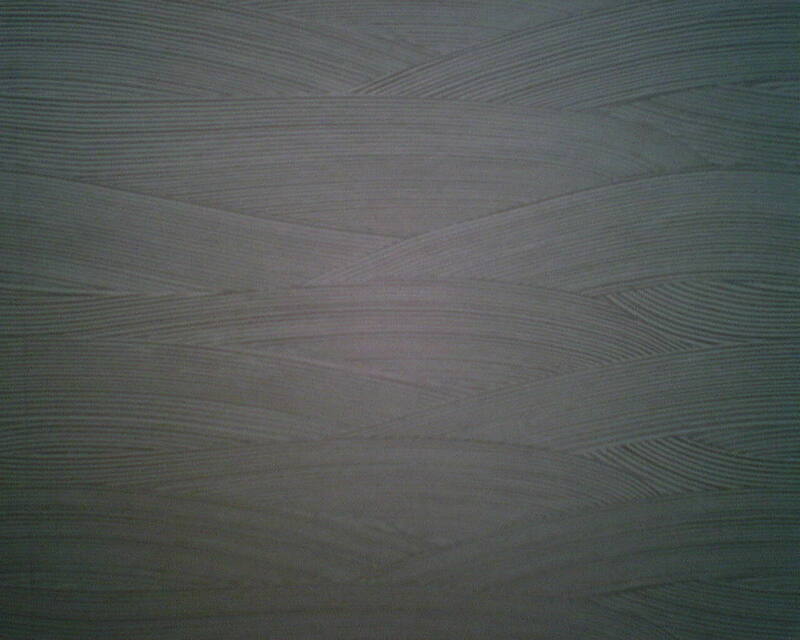 This wallpaper has a wonderful texture, something like an artist’s gesso on a canvas painting. When light hits it from the side, as in the 2nd photo, you can really see the thickness and texture. 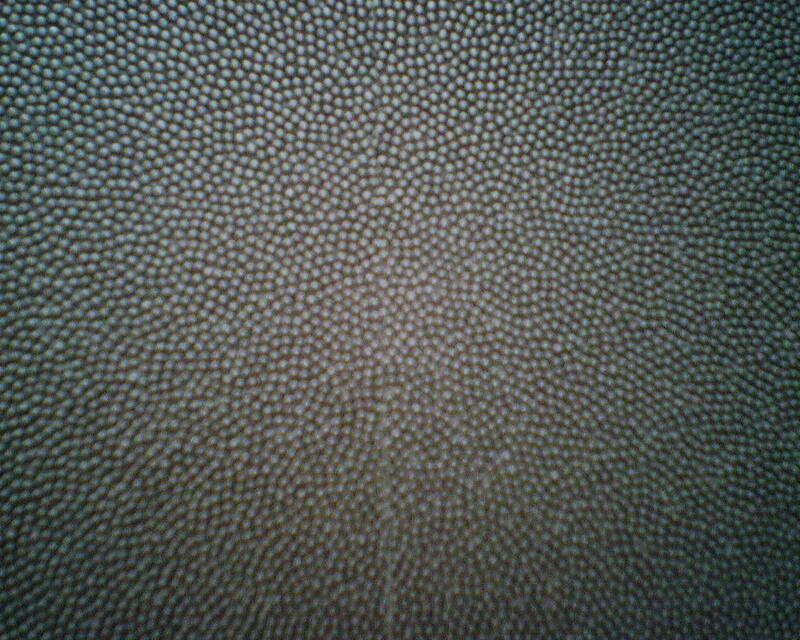 Textures are popular these days, and are usually embossed in heavy vinyl goods, or printed on a heavy non-woven backing, which is the case here. Because the backing is so thick and stiff, it works best on a flat wall with little decorative elements – no turns or corners, not intricate moldings to cut around. Also, as you see in the last shot, the seams can be visible, although in this case they are not too bad. 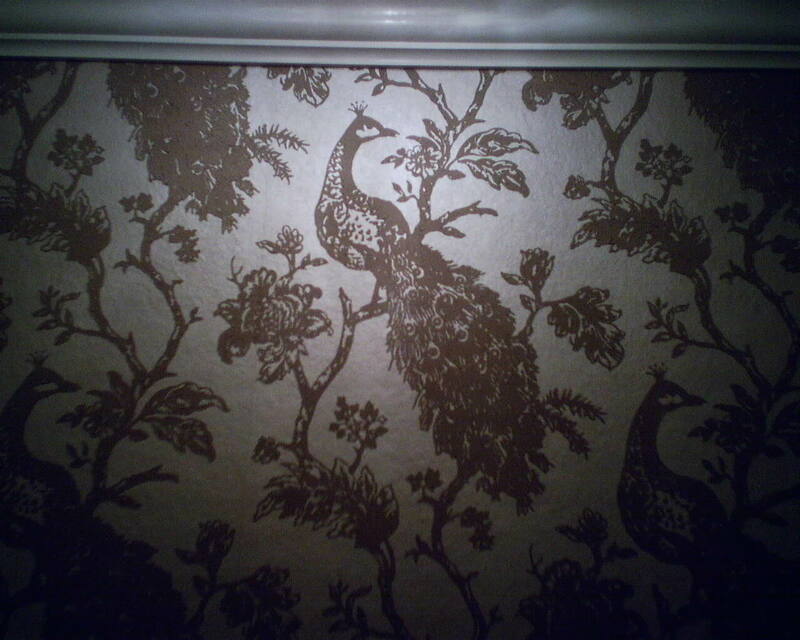 This beautiful peacock pattern is by Ronald Redding for York Wallcoverings, and was sold by Ethan Allen’s Friendswood (Baybrook) store. 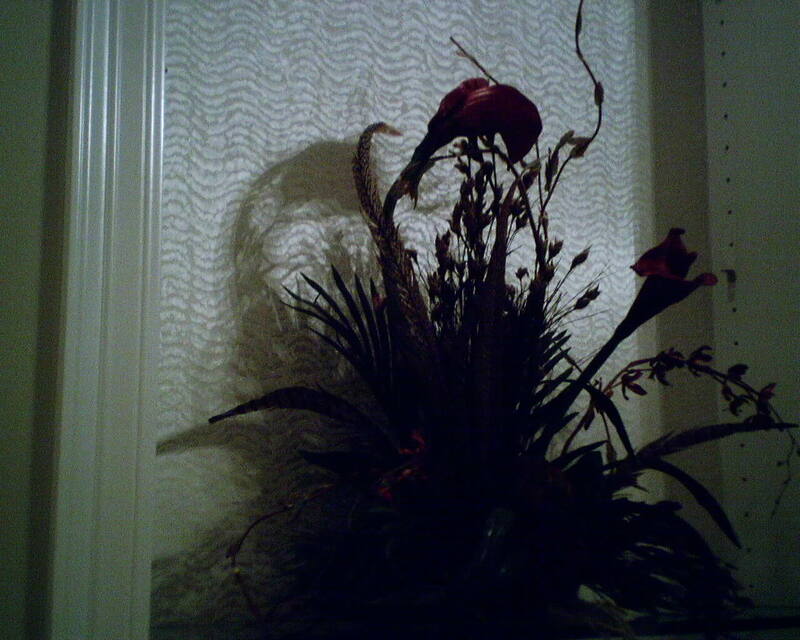 I hung it in a powder room in Clear Lake / Seabrook, that previously had a dark red / black faux finish paper. This pearlized tone-on-tone design was a welcome and brightening update. 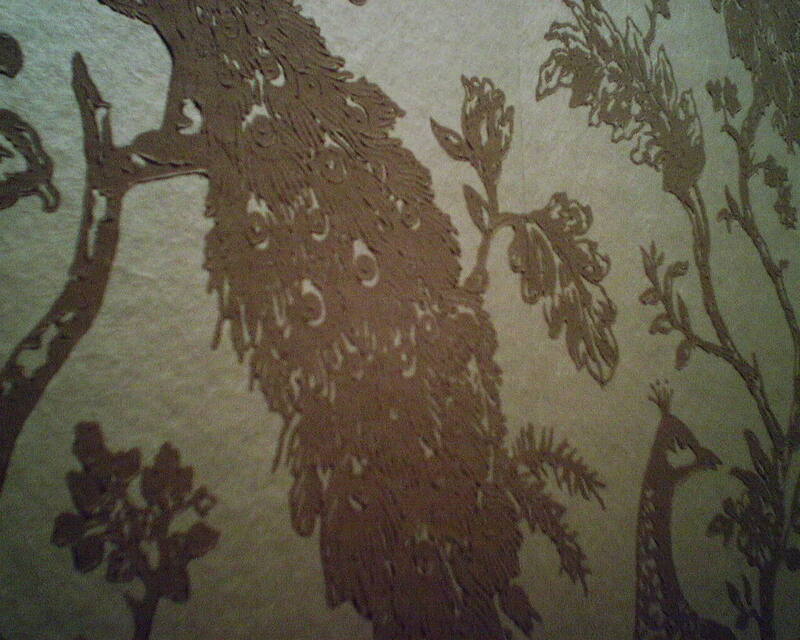 Ink Is an Enemy of Wallpaper! 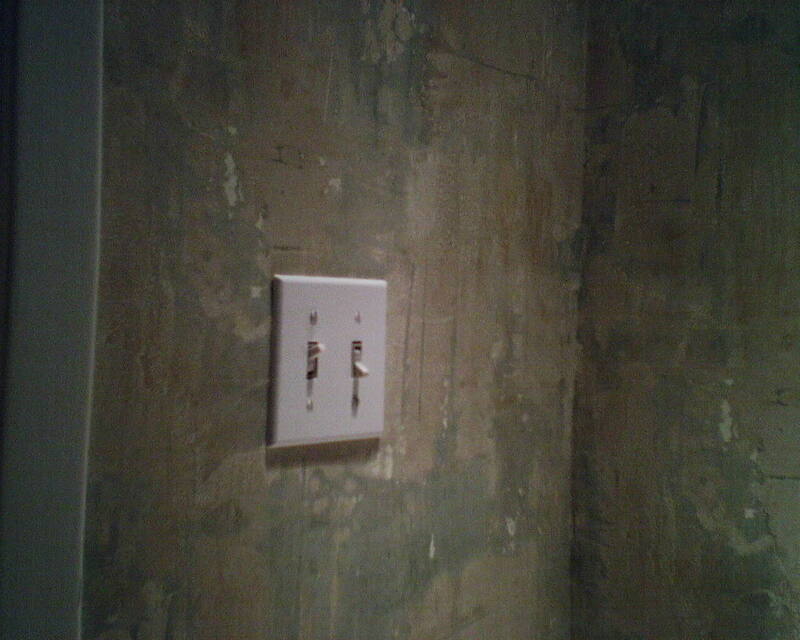 The Sheetrock on this job has a lot of tears, so to get it ready for wallpaper, I am skim-floating it, to smooth it. 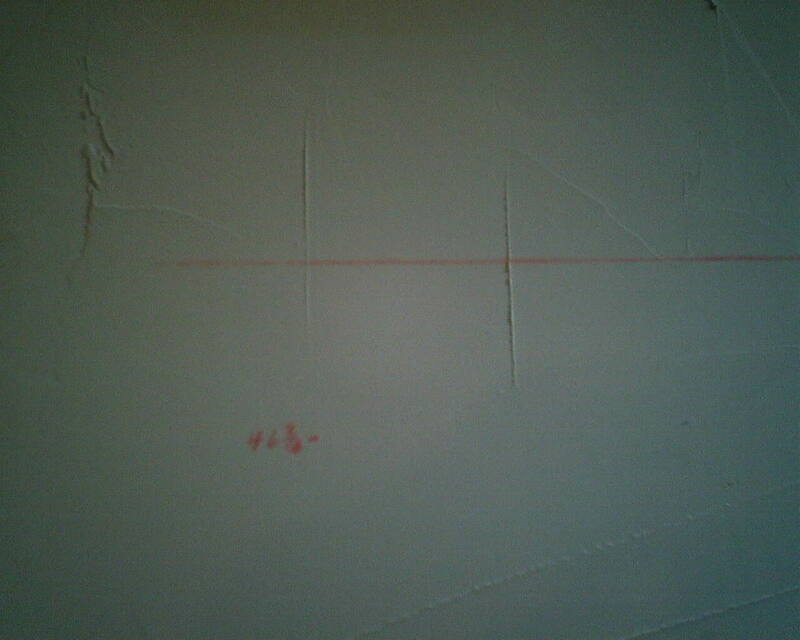 The horizontal red line and the red numbers you see are where someone wrote on the wall in red ink, way back in the ’60’s when this Clear Lake home was built. Mirrors covered this wall for decades, so the ink never showed. 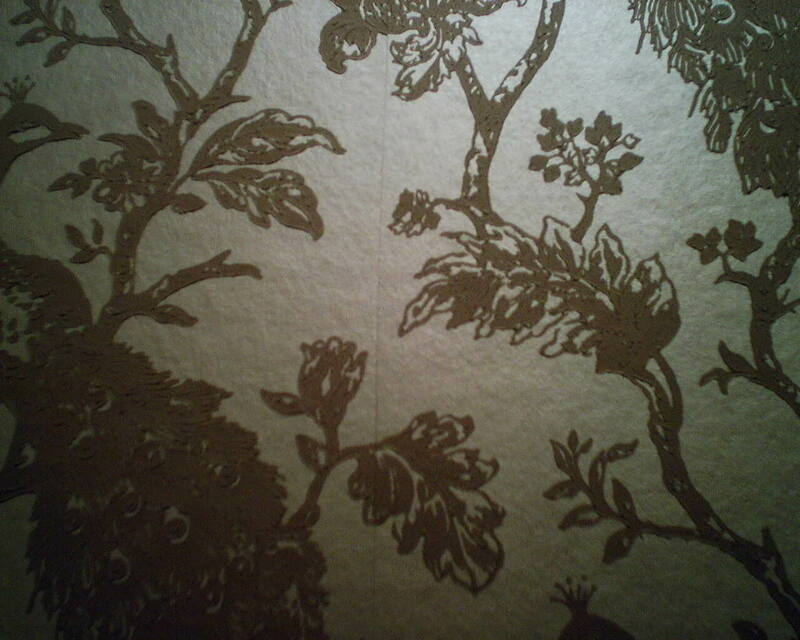 But if I were to hang wallpaper over this ink, it would, rather quickly, I am betting, work its way through the paper and show up on the surface. Several substances will do that, including blood, rust, water stains, grease, and ink – which is why we contractors (are supposed to) only use pencil when writing on walls. The best product to seal this ink is oil-based KILZ, which is a wonderful sealer and stain blocker. However, putting an oil-based product on top of another oil-based product, like ink, sometimes does not work well. So here I have gone over the ink with joint compound. I have found that “mud,” as we call it, contains stains a little better, plus it is porous and allows the sealer to soak in, creating a better seal. As you can see, the ink is working its way through the joint compound, too. So, once the mud is dry and sanded, I am going to put Gardz on the area. Gardz is a very thin, watery sealer that will soak into the mud, hopefully sealing it. Just to be sure, I will add another layer of mud over that. Once that is dry, I will apply a coat of KILZ. If the stains continue to show through, I will apply more coats of KILZ, and possibly more coats of mud, as well. 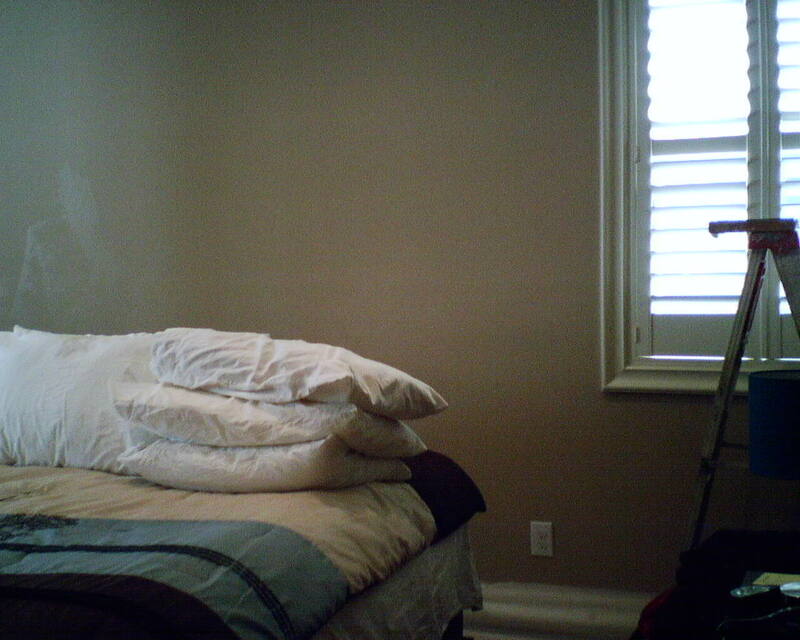 Previously, even with the huge upholstered headboard (not pictured) the painted wall in this master bedroom in a home in Bellaire was boring and lifeless. The lightly textured grasscloth in neutral colors brought in warmth and personality. The homeowner loved it! 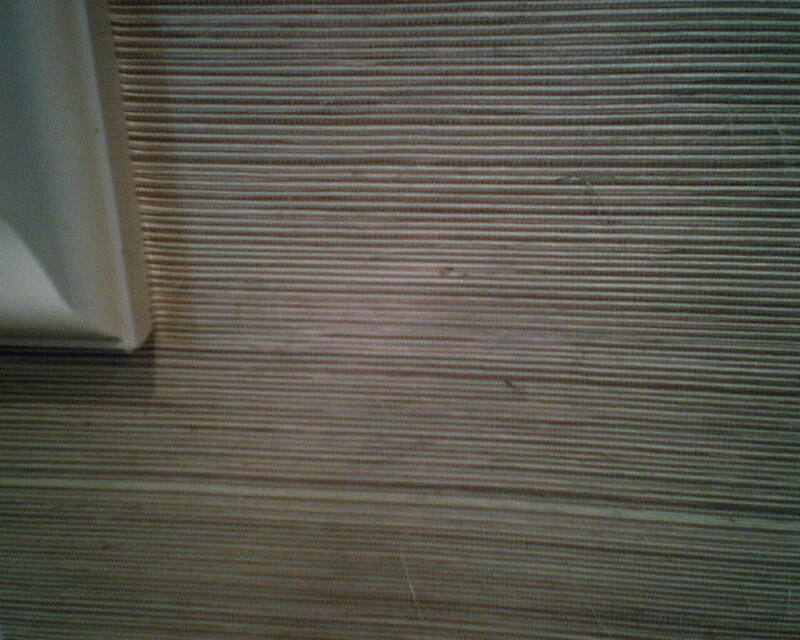 Grasscloth usually comes 36″ wide, and, because it is a natural material with no pattern match, each panel is very visible. 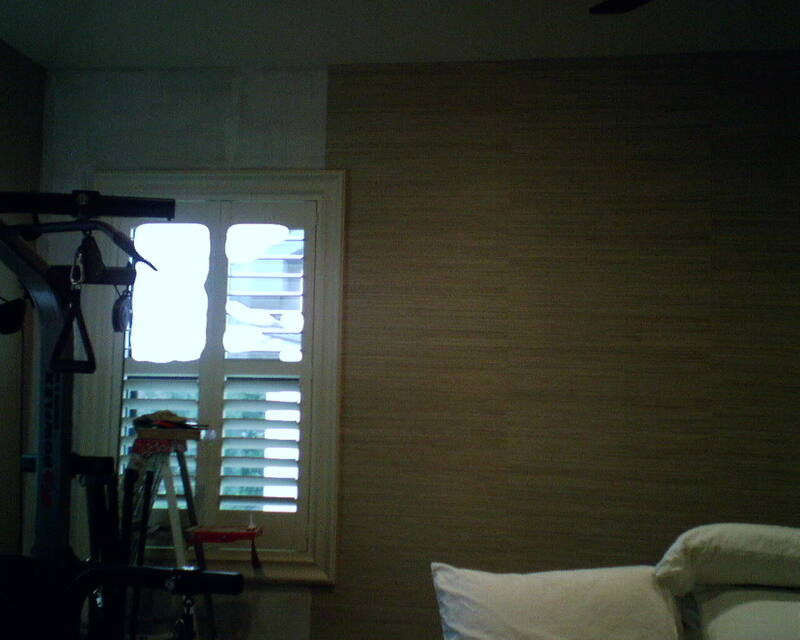 I took care to balance (equalize) the width of the strips, to give a uniform appearance to this accent wall. This meant I had to hand-trim the four main panels from 36″ wide to 30″, and the ones above and below each of the two windows were trimmed to 34″ wide, making sure to center those pieces. Both the right and left seams fell 4″ in from the outer edge of the window molding, adding to the uniformity. 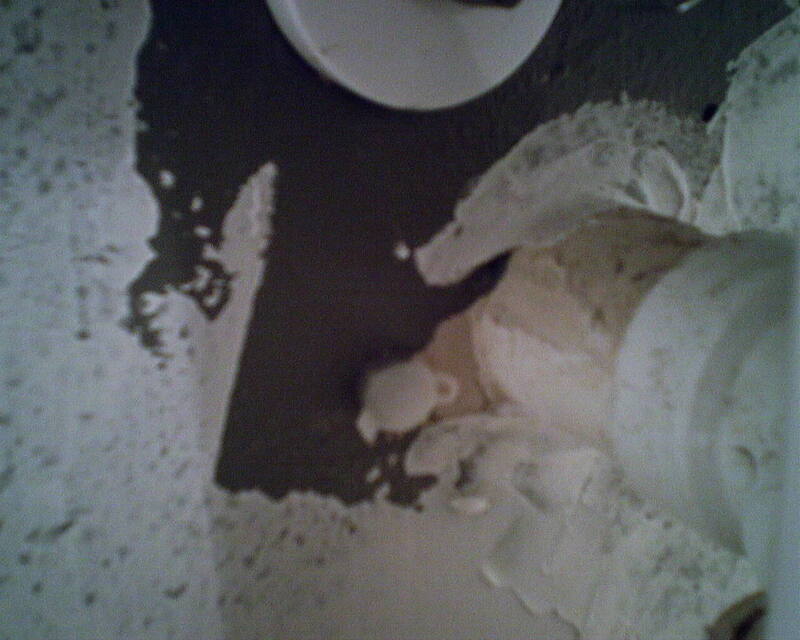 The last photo shows a close-up, so you can see the texture. I was pleased with this product, because there was minimal shading (difference in color from panel to panel). The third bolt did have some shading (it was a slightly lighter shade), so I used it for the strips on the far sides of the wall, which also had shorter seams (over and under the window), so the color difference was less noticeable. The interior designer for this room (the whole house, really) is Pamela O’Brien of Pamela Hope Designs. http://www.pamelahopedesigns.com/ From my end, she is a lovely person to work with, and from the homeowner’s end, Pamela is great at melding her ideas with the client’s taste, and creating beautiful rooms that are still livable for modern, busy families. Under this pedestal sink and toilet, next to the water supply line, inserted into the wall are weird plastic vials with caps. I have seen these before, under sinks, but never behind a toilet. I have no clue what purpose they serve, and have never found anyone who knows, either. All I know is, they are danged hard to trim wallpaper around! “Shrinking Paper” – Can You Spot the Mis-Match? Yesterday I had to stretch some paper; today I had to shrink some. This 8″ high strip was going over a door, and if I used the full width, it would have extended beyond the top of the door and then, of course, down the side of the door and down to the floor. This would have caused me to use a full 8′ of paper, and have a seam (the fewer seams in a room, the better), and would have forced awkward placement of seams and strips all along the next wall. I preferred to start with a new, solid strip to the left of the door. But that would extend over the door into the area where this strip (in the photo) is. The only way I could make that work is if the pictured strip was narrower. I had to remove about 4″, which can mess up the pattern. But it was fairly easy on this short strip over the door, and with this busy pattern. In the first photo, you see the pattern as it is printed. I have cut the design apart from bottom to top, along the green stem and large leaf a little to the left of the center of the strip. Then I slid the right side under the left side, removing excess paper, and then overlapping the left side over the right side. You can see that an olive-colored, downward-facing leaf a little to the right of center in the top photo has moved to the center in the bottom photo. It looked good, but the large leaf had been cut in half, and that looked obvious. So I took the leaf part that had been cut off, cut around it carefully, and appliquéd it back next to its other half. Voilà! In the second photo, you can barely tell that it is not the original design. 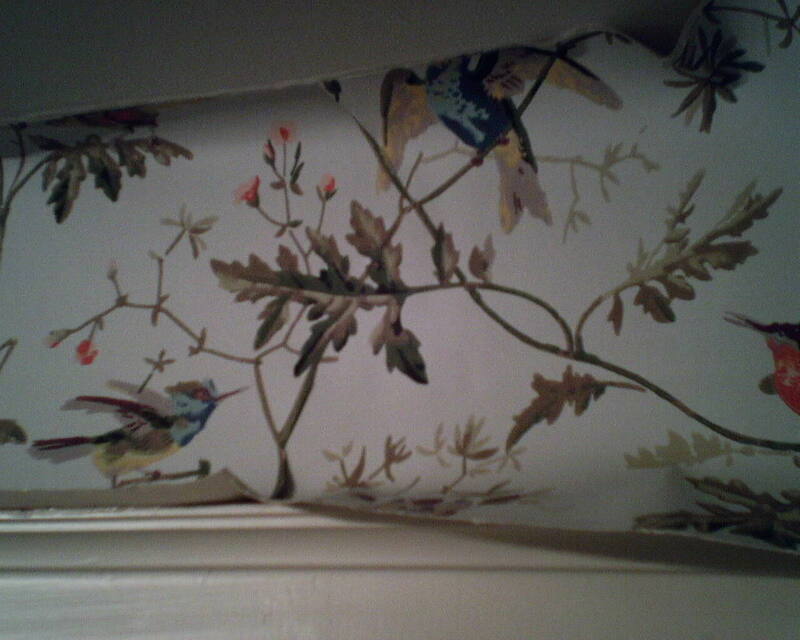 The wallpaper still extended beyond the right side of the door, so I did another similar surgery on a different motif. (No photo of that one.) Once I was done, everything matched perfectly with the full-length strip to the right of the door, there were no seams down that bit of wall, nor any awkward narrow, shifty strips to deal with on the next wall. “Growing Paper” – Can You Spot the Mis-Match? 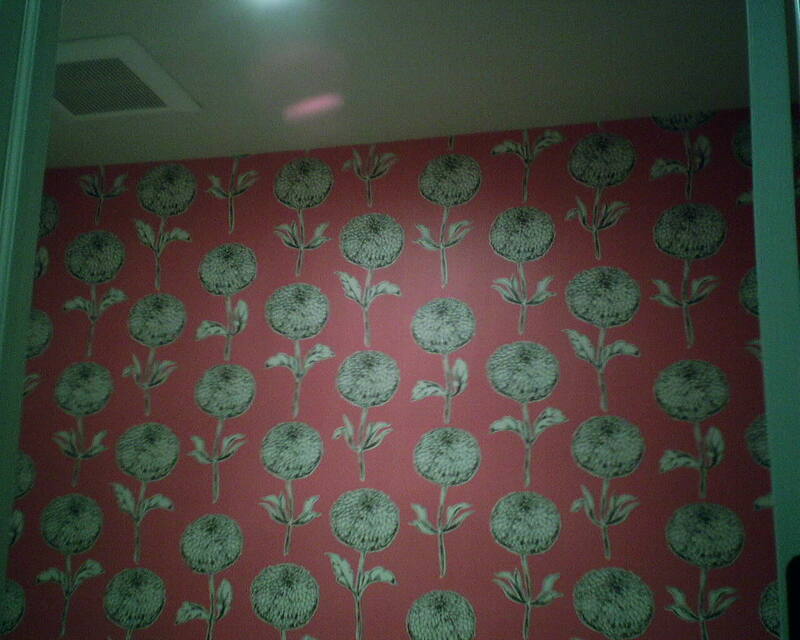 Here is a very pretty (and historic) wallpaper pattern that I am hanging in a master bedroom in the Museum District. This wall has two large side-by-side windows, which can get tricky, especially in a 90-year-old house with un-straight and un-plumb walls and ceilings. I hung the strips to the left of the windows, then the three short strips over the tops of the windows, then three more short strips below the windows. The next strip was a full-length pieces to the right of the windows. The trick is to get the top of the strip to line up with the bottom of the strip. In this case, for various reasons, mostly having to do with crooked walls, there was a 3/4″ gap between the new strip to the right of the windows and the strip beneath the windows. 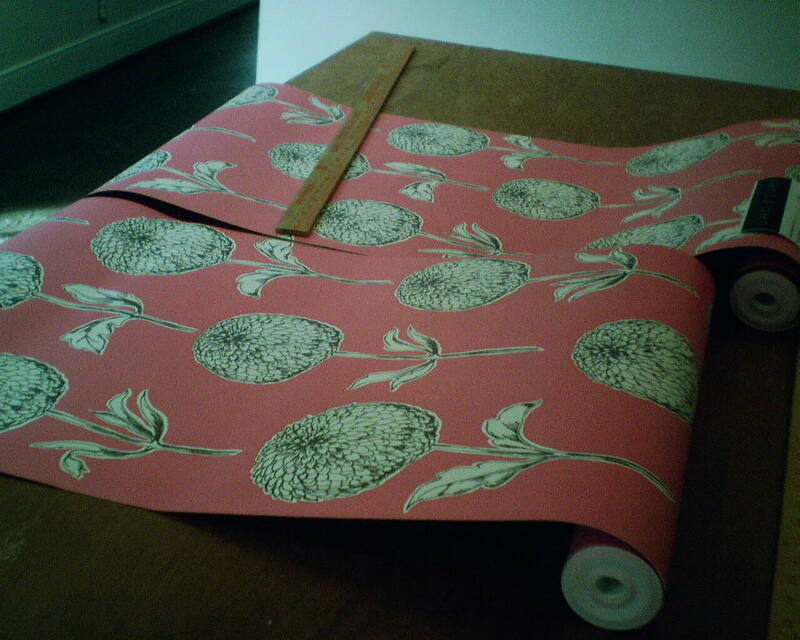 Using paper that matched the pattern, I could splice in a 3/4″ piece. But that would mean that elements of the design would be duplicated, and the eye would catch that. But if I used a part of the design that did not duplicate the pattern, the resulting mis-match would be even more obvious. I gauged that the right side of the design had fewer elements that HAD to remain intact, an the left side had a leaf that would look bad if it got repeated. 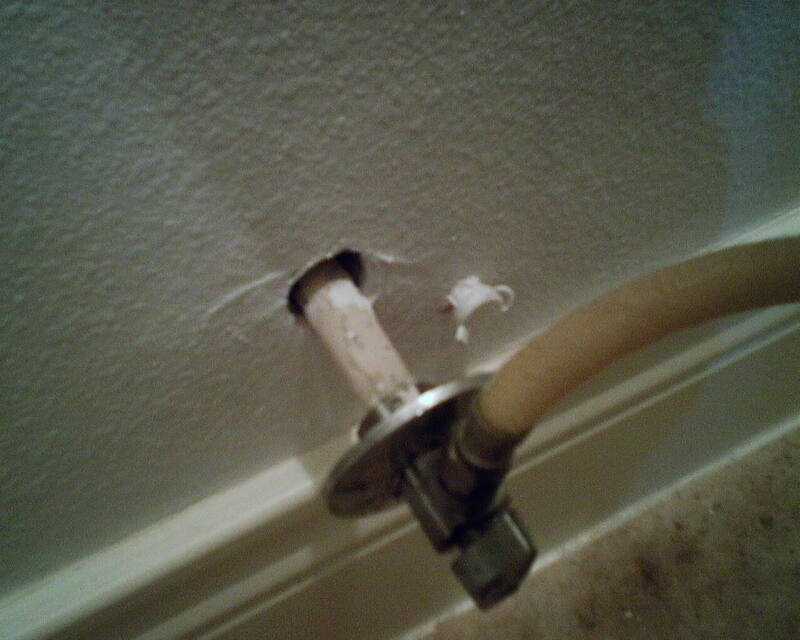 So what I did was to take a 3/4″ wide strip that matched the left side of the full-length strip, and splice it in. But to minimize the mis-match, I cut along some of the design and let it overlap the strip to the left. So now I had a double-image, but parts of it were cut out of the spliced piece, so you only see a little repeating. Then I took some scraps of wallpaper and cut out “appliqués” of leaves and a butterfly, to paste over the repeated elements, to break them up. I even used pencil to draw in a few leaves and stems, again to break up the double image. 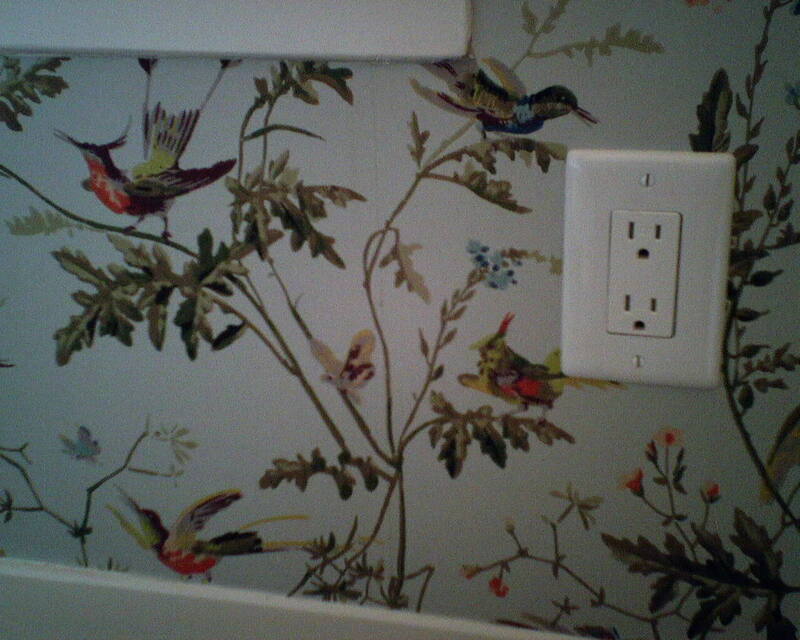 In the photo, to the left of the outlet cover, and to the left of the butterfly, can you see the two twigs that point off to the upper left corner? These are the duplicated images. But they’re not offensively noticeable, because a stem has been cut out, a leaf has been added, and a butterfly is added to break up the straight lines. This wallpaper pattern, a recreation of a historic 1800’s design, is by Cole & Son, a British company, and was bought at a discounted price from Dorota Hartwig at Southwestern Paint on Bissonnet near Kirby. (713) 520-6262 or dorotasouthwestern@hotmail.com. Discuss your project and make an appointment before heading over to see her. You are currently browsing the Wallpaperlady's Blog blog archives for August, 2014.